“Is he off his rocker?” I hear you say. Surely you can’t barbecue desserts let alone grill or bbq cheese – well actually you can. And for those of you that haven’t got a sweet tooth I’ve even got an idea for cheese on garlic bread. Barbecue desserts are pretty simple to do on the charcoal grill because the timing is perfect. When your main course is cooked you can just slide something onto the grill as coals start to gently fade and you'll have a great dessert waiting for you when you've finished your main. I have to say that I’m not one for a dessert and cheese is much more my thing so if you’re like me then do try the Camembert recipe. 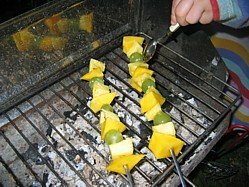 BBQ Grilled Fruit Kebabs - Pictured above. Fresh fruit skewers gently warmed to bring out the natural sweetness.....and then some honey! Bananas With Melted Chocolate - Dark or milk chocolate, it just depends on your taste. Grilled Bananas - topped with vanilla ice cream and smothered in banana liqueur. Pineapple Rings - Marinated in dark rum, add a little brown sugar and allow it caramelize. A fresh fruit dessert to die for. 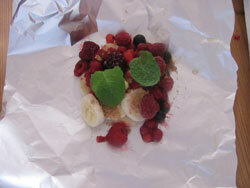 Grilled Summer Fruits - A foil wrapped parcel of naughtiness. BBQ Camembert Cheese served with Garlic Bread - I you love cheese then this is just up your street. Easy to do and perfect for cooking while you eat your main. The best thing about these BBQ grilled fruit kebabs is that whatever fruit you have in will do the job all you’ve got to do is slice it and dice it, slide it onto a skewer and pop it on the grill under a gentle heat. All you're looking to do is warm the fruit through to mobilize the sugars and them just get a little char on the extremities to add color and that caramelized flavor. Take a sharp knife and peel the pineapple and mango. When done, chop up into chunks about 1 inch. Thread the fruit (including the grapes) alternately onto the skewers and then you are good to go. Grill your fruit kebabs over low heat for about 10 minutes. To finish it off when you’re almost ready to serve, take a teaspoon of honey and drizzle it over the kebab just to caramelize slightly. If your heat is gentle then you’ll be OK, just be careful not to allow the honey to burn. Serve your BBQ grilled fruit kebabs with a little yogurt and you're good to go. Take a look at the ingredients for this grilled Summer fruits recipe you might start to scratch your head because on the face of it, fruit, mint and Tia Maria don't quite seem like a match made in heaven but believe me, it really does work. You can use any Summer fruit that's available and if I'm being honest – I got mine down the freezer aisle in my local supermarket. 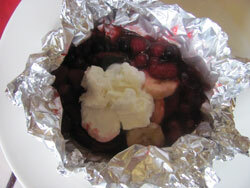 The fruit is all wrapped up in a foil parcel and left to grill gently over a low heat. Make for squares out of your foil and smear the top side with butter. Now add your fruit, sprinkle a teaspoon of sugar onto each followed by a teaspoon tip of cinnamon and a few fresh mint leaves. Form the foil so that nothing can spill out and add a lug of Tia Maria to each before scrunching up the top to form a nice parcel. Place the parcels on the grill over a low heat for 15 – 20 minutes before opening them up. You can transfer to a bowl or simply eat straight out of the foil but before you serve up, carefully open the parcels and breathe in..........fantastic! Finished off with a dollop of freshly whipped cream and you'll think you've died and gone to heaven.